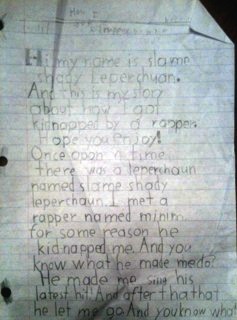 Posted on August 10, 2011, in School Assignments, Stories and tagged All Things Fnkybee, Chase McFadden, Eminem, funny writing, Grammy Award-winning, Humor, Ironic Mom, kid writing, Kids, Leanne Shirtliffe, Lucky Charms, Slim Shady, Some Species Eat Their Young, Stuffkidswrite.com. Bookmark the permalink. 2 Comments. 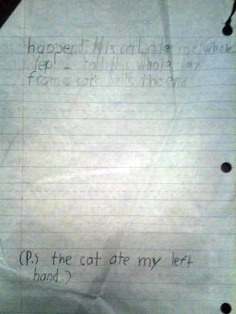 It totally doesn’t surprise me that minim has a cat that eats leperchuans. This kid’s a hit! It would probably be more surprising if he didn’t.